Clash Maniac's TH9 upgrade completed and I've been actively upgrading structures ever since. 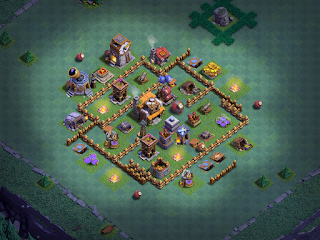 I'm running a slight variation of the Crows TH9 base and it's doing ok. I'm considering moving to my previous mod of Crows (Raven) as my games running that version are seeing better results right now. I'm still comparing them though, so, for now, it works. Giants are almost done upgrading to level 6 finally; that will significantly improve my GiBarch so raiding will become much more profitable. The Archer Queen is up to level 6, I've been working on getting defenses up to TH7/TH88 levels as well; all that remains is an AD and Wizard Tower (2 levels on each) then I can start working through the Archer Towers and Hidden Teslas. Kuss Von Nacht (rushed TH11) is coming along VERY nicely. I'm almost to maxed Baby Dragon, all defenses are at least TH9 and I'm working on traps and heroes right now. The GW is at level 10, AQ is about to go down for level 15, BK is at level 14. Nachtherr (TH9) is now just walls and heroes. All elixir troops have been upgraded, all elixir spells as well, so I can put elixir toward walls along with gold. I'm working on dark troops right now - EQ and Haste are maxed for this level, Witch and Lavahound are also maxed, and Golem finishes up in just a couple of days. I like working top down on DE upgrades; it feels "easier" to me, especially when I'm working on multiple games. Slowing down a bit on this game has allowed me to work toward maxing troops and heroes in anticipation of the TH10 upgrade. I'm right almost to the point I pulled the trigger on my TH10 upgrade for my main game, although I am seriously considering maxing my heroes and getting all of my walls to level 9 before I take this one up to TH10. Just another way to get there. The other games are progressing steadily, with most builders staying fairly active. There are plenty of lower cost upgrades that I can run on most of my active games, so keeping builders and lab running non-stop is actually pretty easy. I haven't had much time for these games, between work/holidays/life, so I'm playing my usual, casual style. Each day, at least twice a day, I go through all of my actively building games to empty resource collectors, reset traps, and start upgrades. Sometimes, especially if I'm getting close and don't want to deal with a raid, I'll toss up a shield and boost a resource collector to get me over the top sooner. I'm particularly looking forward to the one-gem-boost that should be starting up here soon. There's little time in my schedule for warring or raiding right now, so I'm just using shielded collector boosts to build up resources. This has worked very well on my games, TH7 thru TH11. I'll probably start hitting the warpath again after the holidays pass and I get some much needed clutter management done around the house. I mention this because I want to show others how you can rush, play casually, and still move quickly through the game so long as you set some realistic expectations. Most importantly - it's still a very enjoyable experience. And on that note...happy holidays!! !